Today’s competitive markets increasingly force difficult trade-off decisions: At what point do cost containment efforts start impacting value creation? Are there solutions competitors are investing in that may cut into market-share? VProA has developed an offering designed to help smaller businesses make tough resource decisions with less pressure. We provide professional staff with skills covering all aspects of business administration, as needed. Backed by our experience, technology and business processes, VProA staff work more efficiently, and at less cost. Consider the example of a client General Manager spending 35% of the time working on non-core administrative tasks. The Value Enhancement chart demonstrates what happens with the addition of VProA Coordinator working 20 hours per week on: Office admin & Coordination; Communication (including e-mail); Scheduling; Logistics; Simple research and reports projects. 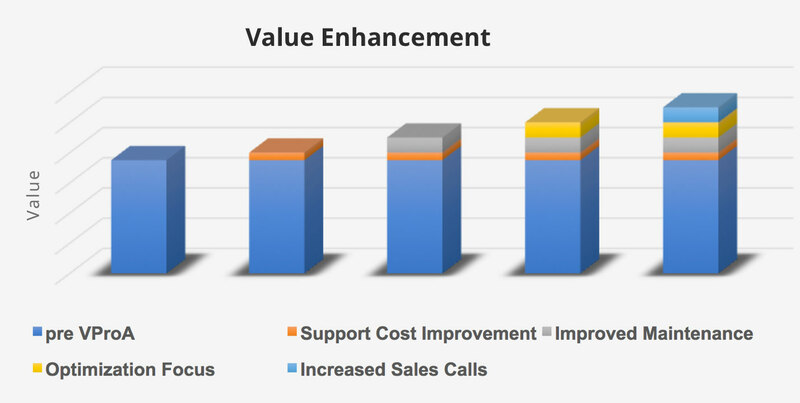 VProA support professionals help free-up client core staff so they can increase focus on Value Creation. The Results from our support are easily seen, and easily measured. The staff we assign to specific client needs are intended to become virtual extensions to existing client organizations, working as needed. Being part of the client team enhances communication and collaboration, promoting overall effectiveness. Aligning with professional services experts allows smaller firms to increase focus on their own expertise.